Thomas Bird Coleman [1794-1836], son of the sitter, Cornwall, Pennsylvania; his daughter, Margaret Coleman Freeman [1820-1894], Cornwall, Pennsylvania; her daughter, Margaret Freeman Buckingham [1857-1946], Washington, D.C.; her nephew, William C. Freeman, Cornwall, Pennsylvania; gift 1947 to NGA. [Opening exhibition], Maier Museum of Art, Randolph-Macon Woman's College, Lynchburg, Virginia, 1952-1953, no cat. Eichholtz' portraits of Ann and Robert Coleman were both executed on a medium-weight, plain-weave fabric support. They were removed from their stretchers and marouflaged to hardwood panels during treatment in 1935, which resulted in a disfiguring emphasis of the fabric weave in both paintings. Cusping exists along the left and right cut fabric edges. Paint was applied in a fairly free and fluid manner over a thin, white ground layer, using both wet-into-wet and wet-over-dry techniques. Although mostly opaque layers were employed, there is appreciable glazing in Robert Coleman's coat and in the red color of the background in Ann Coleman's portrait. Robert's face appears reasonably finished, in contrast to his very sketchy hands. The backgrounds of both pictures appear to have been painted after the completion of the figures. The red paint of the chair is visible through some of the thinner areas in Robert's left arm, suggesting that there were minor compositional changes in the outline of the figure. The paint appears to be in good condition although it is slightly thin in certain areas. In Robert's portrait there is slight abrasion (and consequent inpainting) in certain areas of the background. 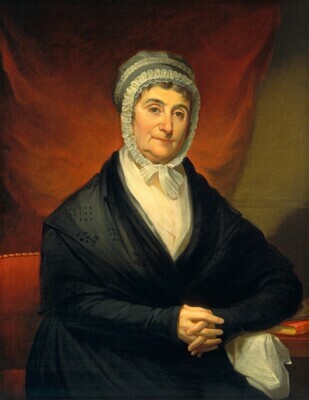 In Ann's portrait, some of the folds in the drapery have been slightly strengthened by later inpainting. The varnish has become slightly discolored on both paintings. Milley, John Calvin. "Jacob Eichholtz, 1776-1842." M.A. thesis, University of Delaware, 1960: 358-359. Beal, Rebecca J. Jacob Eichholtz, 1776-1842. Philadelphia, 1969: 39, no. 127. American Paintings and Sculpture: An Illustrated Catalogue. National Gallery of Art, Washington, 1970: 54, repro. American Paintings: An Illustrated Catalogue. National Gallery of Art, Washington, 1980: 152, repro. Kelly, Franklin, with Nicolai Cikovsky, Jr., Deborah Chotner, and John Davis. American Paintings of the Nineteenth Century, Part I. The Collections of the National Gallery of Art Systematic Catalogue. Washington, D.C., 1996: 207-211, repro.